The bulldog is the mascot for hundreds of universities and schools. Typically mascots are meant to be intimidating but this couldn’t be farther from the truth for bulldogs. Although in the past this breed was more aggressive, today, bulldogs are sweet and kind that it’s impossible to picture them as aggressive! 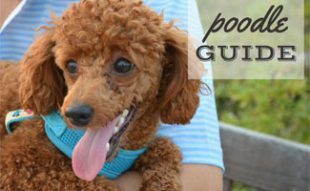 Learn more about this lovable breed. Bulldogs can be traced back to the 5th century as a breed called Alaunt in the UK. Bulldogs were originally bred for aggression and to help butchers control livestock. Bulldogs were used in the “sport” called bull-baiting in the UK during the 15th century. This sport consisted of trained dogs being latched onto tethered bull’s noses. They were not let go until the bull was either pulled to the ground by the dog or the bull had killed the dog. Bull-baiting was not only a sport but also used to help make the meat of the bull more tender before butchering. Bull-baiting wasn’t banned until 1835. After this, it was thought that the breed would become extinct. However, in the U.S. bulldogs were used to help herd cattle. Bulldogs in the U.S. were larger than those in England. There is some disagreement on how this occurred. Some believe it was because of selective breeding two smaller bulldogs while others believe it is because of cross-breeding with pugs. There are three types of bulldogs we are going to discuss: English, American and French. For American bulldogs, there are also two different types: Johnson and Scott. These variations are based on physical appearances. John D. Johnson is accredited with creating the American Bulldog. As a teenager in the 1930s, John began breeding the remaining herding bulldogs. In the 1960s he teamed up with Allen Scott; however, they eventually parted ways because they pictured the American Bulldog as two different dogs. John created the larger, short-muzzled bulldog while Allen bred the smaller, athletic looking bulldog. These are now known respectively as the Johnson Type and Scott Type. 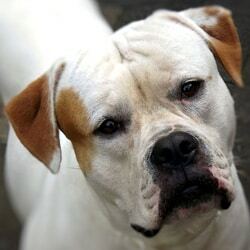 The American Bulldog has a muscular body with a large, square head and jaws. The breed has muscular cheeks and a furrowed brow look. The nose is black, the eye rims are black and the ears can be rose, half-pricked or pendant. The muzzle is box-shaped and the lips are loose. The tail is low-set and tapers to a point and the hindquarters are muscular and broad. Males can grow between 22-28 inches tall and 70-120 pounds. Females can be 20-26 inches tall and 60-100 pounds. The coat is short and harsh-textured and can be white, brindle, red, tan or brown or any combination of these colors. The English bulldog is smaller than the Johnson Type and the Scott Type. The English bulldog is medium-sized with a large head and drooping jowls and wrinkled face. They have broad chests and wide-set shoulders. The ears are rosed and their noses are black. Their skin is loose and their coats are short and either brindle, white, fawn, red or piebald. Males average about 50 pounds and females 40 pounds. Females’ characteristics are less exaggerated making them appear less “bulldogish”. 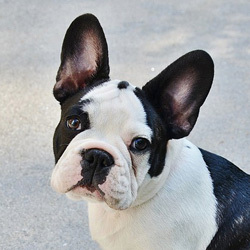 The French bulldog is most recognized for its bat-shaped ears. They are typically less than 28 pounds and their coats are brindle, fawn, white and brindle and white. The coat is also short and smooth and relatively easy to keep clean. They love being cared for and adored. So in order of smallest to largest, it goes French Bulldog then English Bulldog then American Bulldog – Scott Type then American Bulldog – Johnson Type. The bulldog was officially recognized by the AKC in 1886 and the French Bulldog in 1898. The bulldog page looks like it’s more over the English Bulldog than the American Bulldog. 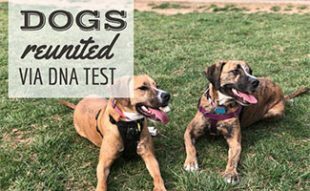 According to this article, we need an American Bulldog club to request recognition from the AKC for it to be noted as an official brand! So if you’re part of an American Bulldog club, you should contact the AKC! 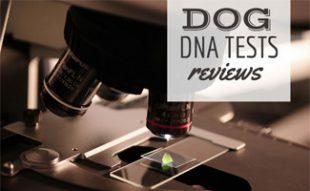 Bulldogs are generally a healthy breed but can have some health issues. Because of their short noses they can have breathing difficulties which can cause snoring. Bulldogs often experience skin problems and infections due to the folds in their skin. Hip dysplasia is also a common factor for bulldogs because of their heavier build. The English Bulldog in particular, has specific health problems. According to Petplan (one of our top picks for best pet insurance), the most common health issues found in this breed are atopic dermatitis, corneal ulcers and otitis externa. These conditions can be expensive to treat. In fact, Petplan’s data shows that the average cost of treatment for atopic dermatitis is $833, $747 for corneal ulcers and $407 for otitis externa. With so many common bulldog health issues and concerns, we recommend getting pet insurance to protect your wallet and your dog’s health in case of emergency or illness. The first bulldogs were aggressive due to their bull-baiting use. They have transitioned into sweet, mellow pets. 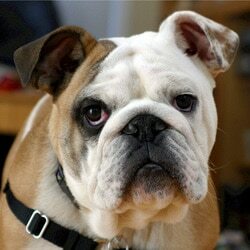 Although bulldogs look grumpy and aggressive, they are actually calm, courageous and friendly. They can be mistaken for being lazy but really they’re just easygoing. They make for great family pets since they do well around children. Take a look at how good these bulldogs are with babies. They don’t seem at all phased by the babies dressing them up with necklaces, crawling all over them or high-pitched hollers. (And the babies aren’t phased by all the licking and sniffing!) It’s absolutely adorable! Bulldogs enjoy walks and like to play as well. They require regular exercise but the summer heat can make breathing difficult for them due to their short snouts. It’s best to take them on moderate walks and let them enjoy the air conditioning in the hot afternoons. According to this intelligence ranking, bulldogs rank as 77 and French Bulldogs rank at 58. Bulldogs rank at the lowest degree of working/obedience intelligence. It says they understand new commands after 80-100 tries and obey the first command 25% of the time or worse. Although this breed doesn’t catch onto things quickly, if you dedicate yourself to training your bulldog they will learn (it just might take some time). As for French Bulldogs, 58 means fair working/obedience intelligence. 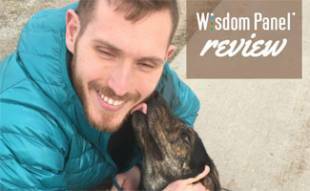 They understand new commands after 40-80 repetitions and obey the first command 30% of the time or better. Should You Get A Bulldog? Does this breed appeal to your liking? Bulldogs are great companion dogs and make life more vibrant and fun. They not overly rambunctious but not lazy either. Their even temperament makes them great for kids to be around and their personalities are absolutely addictive. What do you love most about bulldogs? I really like the american bull dog. The scott , always been attacked to the muscular type of dog. I really wish the English bulldog breed would be banned. The poor things can barely breathe and their mouths don’t have room for their teeth. As sweet as they are, we really need to stop reproducing these poor guys. I worked for years at a vets office and can confirm most English bulldogs and French bulldogs are dead by six or eight years old which is a VERY short life span and there are huge vet bills along the way. 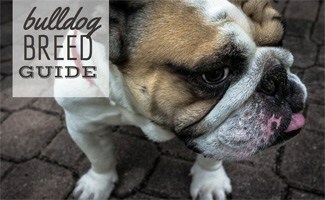 Thanks for sharing this information abut the bulldog breed! Our 10 year old English bulldog is healthy and active. He requires love and care like any dog. We have had other breeds requiring far more care. I wouldn’t trade his love and slobber kisses for anything and hearing his snore means he is okay and happily sleeping. Bulldogs are not a healthy breed (except possibly the American bulldogs they look a lot less extreme) they all suffer from brachycephalic airway syndrome and brachycephalic ocular syndrome to a greater or lesser extent. This means they all suffer from some difficulty in breathing and some individuals suffer from extreme difficulty to breathe. They all have shallow eye sockets (making eyes more prone to injury or popping out) and they all have excess wrinkling and skin folds which can easily get infected due to the build up of moisture, dirt & bacteria/yeast. All brachycephalic dogs also have extremely bad dentition—they have full sized teeth crammed into a mouth too small for them, causing food to get stuck easily and cause decay, and making chewing more difficult and sometimes very painful for the dog. ALL of these issues can be remedied by breeding for a longer muzzle and a less rounded, less massive skull. Please, if you’re looking for a new pet bulldog, choose one with less exaggerated features (i.e. get one with a longer muzzle, smaller head, longer legs and narrower shoulders). This will ensure your pet is healthier, more physically able and more happy than a dog with multiple crippling deformities like the show bred bulldog has. Please refrain from generalizations like “all”. Not all bulldogs have health issues like those mentioned here. Our Scottish Terrier was allergic to grass and had breathing problems. He had to be groomed regularly. Our 10 year old English bulldog has had no more problems than most dogs and none of the issues listed here. I keep his ears, nose, and wrinkles clean and bathe and groom him myself. In return we have a healthy, happy, active and affectionate bully. I wouldn’t trade him for any other breed. Bulldoglover… I agree with you 100%. We have had 3 bulldogs… 2 still here… and I love them more than life itself. These dogs are just different and i love every single thing about them. Even if i have to wipe their butts after pooping or clean their folds and ears daily… i love their snoring and I love how we have conversations together. They are just Love Bugs. That’s all they want to do. Love and be love.. and eat too. Love my babies. Only bulldog owners understand!! I love my bulldog Lola! She’s the most precious pup ever, an English Bulldog I got from a rescue shelter, a breeder didn’t want her anymore but I am so happy she came into our loving home as I couldn’t imagine my life without sweet little Lola, her face is so pudgy and cute I want to kiss it all the time!